Looking for a job in DeSoto County Florida? This DeSoto County Florida job guide is a resource for job seekers looking for legitimate employment opportunities in the region with an emphasis on government positions, top healthcare employers, public school careers, and major job boards. 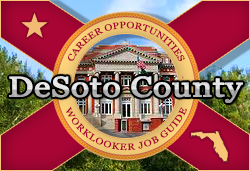 DeSoto County Florida | DeSoto BOCC periodically posts a variety of employment opportunities. During this review there were open positions available for Firefighter Paramedic, Treatment Plant Operator, Deputy Sheriff, Corrections Officer, IT Support Specialist, 911 Dispatcher - Telecommunicator, Appraiser, and Assistant Kennel Technician. Check for new listings. The City of Arcadia had job openings on this review date. A survey of employment listings had included Public Works Laborer, Systems Laborer, and Water Treatment Plant Operator. Visit Arcadia's employment portal using the link below. Tractor Supply Company TSC is a great place to work if you embrace the Out Here lifestyle. Publix is continually recognized as one of the best places in America to work. In addition to being a great place to work, Publix prepares associates for new opportunities through their tuition assistance program. Associates can receive assistance in covering the cost of graduate and undergraduate degree opportunities in many areas of study. It also covers some individual courses, online programs and technical training. The Arcadia plant produces up to 12 million boxes of oranges (and occasionally grapefruit) annually. Contact to inquire about employment opportunities. Desoto Automall in Arcadia, FL, is proud to be an automotive leader in our area. Here there had been open positions such as Automotive Technicians, Diesel Technicians, Collision Auto-body Technicians, Automatic Transmission Technicians, and more. Contact Bethel Farms to inquire about opportunities. DeSoto Memorial Hospital frequently hires nurses and for a variety of healthcare specialties and support positions. During review there were open positions posted for RN Registered Nurse ER, RN Registered Nurse OR, Respiratory Therapy Jobs, RN Registered Nurse OB, Full Time Licensed Pediatric Physical Therapist, and Occupational Therapist OT. DeSoto Health and Rehab at Arcadia exists to meet the health care needs of those needing nursing and rehabilitation services in DeSoto county. During review there were many per diem positions available. A survey of open positions found included Physical Therapist, Speech-Language Pathologist, Desoto Health & Rehab, Occupational Therapist, Desoto Health & Rehab, Certified Occupational Therapy Assistant COTA, Registered Nurse RN, Licensed Practical Nurse LPN, and Certified Nursing Assistant CNA. Precious Angels Home Care of DeSoto provides quality, safe, and cost effective home care services to persons in need. Therapeutic FX is a growing and highly regarded therapy clinic in Arcadia, Florida. Here you may find open positions for Massage Therapists, Physical Therapists, Physical Therapist Assistants PTAs, and Speech and Language Therapists (SLTs). Tidewell is one of the nation's premier end-of-life care providers that provides competitive salaries, a dynamic benefit program, and a focus on continued personal and professional development for its employees. The Florida Department of Health provides a listing of open positions by location. The Friendship Centers is a nonprofit network in Southwest Florida with services that meet the needs of people 50 and older. The School District of DeSoto County is an excellent resource to monitor for both teaching jobs and support staff positions. Here you may periodically find employment opportunities such as ESE Teacher, Custodial Jobs, Math TEacher, PE Teacher, Reading Teacher, Attendance Clerk, School Clerical Jobs, Food Service Worker, School Custodian, Deaf Hard of Hearing Interpreter, Instructional Coach, School Bus Driver, Kindergarten Teacher, 4th Grade Teacher, 5th Grade Teacher, Language Arts Teaching Jobs, Art Teacher, Phys Ed Teacher, 3rd Grade Teacher, and more. South Florida State College periodically hires faculty, instructors, and support staff for their DeSoto Campus. DeSoto County Economic Development is a good resource for job seekers looking for regional data such as top employers, business and entrepreneur resources, demographics, economic indicators, education information such as a listing of secondary schools, and more. The DeSoto County Chamber of Commerce can be used to browse area businesses by using their online directory. The Chamber also provides a community overview, newsletter, and relocation resources. This is a great jobs resource. Here you may find employment opportunities such as Bank Teller, Therapist, Licensed Clinical Social Worker, Youth Care Worker, Retail Jobs, Sales Associate, Custodial Jobs, Truck Driver, Registered Nurse RN, Computer/Network Technician, Case Manager, Store Manager Restaurant, Cashier, Mechanic, Waiters and Waitresses, Licensed Practical Nurse LPN, Clerical Jobs, Medical Assistant, Behavioral Health Technician, Customer Service Associate, Clerical Jobs, Dispatcher, Police Officer, Hospitalist, Medical Technologist II, Counselor, Teacher and more. The Sun Classifieds covers Arcadia as well as other locations in the region. CareerSource Heartland offers workforce development opportunities for businesses and job seekers in DeSoto, Hardee, Highlands and Okeechobee Counties. This Worklooker directory includes The City of Sarasota, Longboat Key, Sarasota-Bradenton International Airport, North Port, and Venice area employers. This Worklooker directory includes Bradenton, Bradenton Beach, Holmes Beach, Longboat Key, Palmetto, Blake Medical Center, Manatee Memorial Hospital, and more. This Worklooker directory includes Sebring, Avon Park, Lake Placid, Highlands Regional Medical Center, Florida Hospital Heartland, local schools, and more. This Worklooker directory includes Punta Gorda Chamber of Commerce, Peace River Regional Medical Center, Fawcett Memorial Hospital, Charlotte Regional Medical Center, Charlotte County Public Schools, and more.